Stephanie Kuroda stars as Sadako, a survivor of the World War II atomic bombings in Japan who is dying from leukemia, known in postwar Japan as the "A-bomb disease," in Honolulu Theatre for Youth's "A Thousand Cranes." No matter why people go to war, children are invariably among the victims, be it a conflict between villages or the worldwide holocaust we remember as World War II. Children died in Nanjing and Chongqing, in Warsaw and Rotterdam, in London, Cologne, Berlin and Manila, and in the man-made firestorms that incinerated Hamburg, Dresden and Tokyo. Children also died at Hiroshima and Nagasaki when the United States dropped the two atomic bombs that ended World War II. Honolulu Theatre for Youth explores the human cost of warfare with "A Thousand Cranes," the story of a Japanese girl who survived the war itself, but died a victim nonetheless. The story is based on the life and death of Sadako Sasaki, who was 12 when the war ended. Although she appeared to have survived the bombing unscathed, she was one of many later diagnosed with leukemia -- known in postwar Japan as the "A-bomb disease." She started folding 1,000 paper cranes, hoping she would be cured, but died before the task was completed. 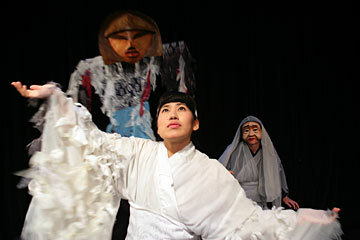 HTY director Reiko Ho is using masks, music, origami and butoh-style choreography to suggest the postwar Japanese setting. The story is a surrealistic tale of hope, culture and courage as Sadako embarks on a thought-provoking journey in the cause of world peace as she makes the transition from life to death. The use of butoh-inspired choreography is particularly appropriate, as butoh is a product of post-WWII Japanese culture and reflects the tremendous disruption of tradition caused by the abrupt end of the Pacific War and the American occupation that followed. Stephanie Kuroda stars as Sadako, with Hermen Tesoro Jr. as her father and Dusty Behner in the dual roles of Sadako's mother and grandmother. Expect a story about ghosts and spirits in Hiroshima and, perhaps, in all the other places in the world where children have been -- and continue to be -- innocent victims.